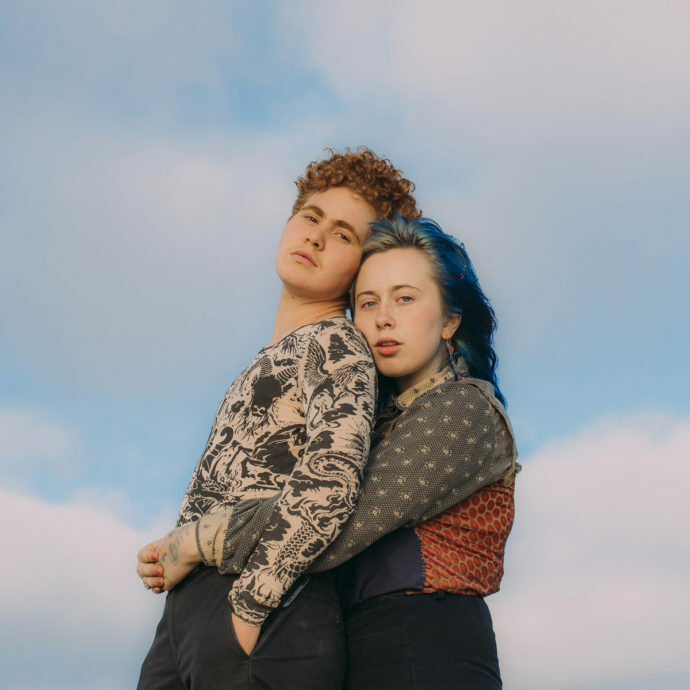 Girlpool’s albums have always documented moving from one chapter of life to the next like childhood to adulthood or moving from one relationship to another. Unlike these transitions in life, which are fallen into, Girlpool’s sound has changed since their self-titled EP and it seems deliberate. Their last album, Powerplant, was like a fog filled teenage dream. Like most great art, honesty and sincerity works best and Girlpool have always found fans in optimistic but sad kids who know things can be better. With the addition of synth, heavy beats and dark pounding vocals, their new sound is grown up while never letting going of teenage grunge. What Chaos is Imaginary amalgamates their previous sounds to create a cacophony of dreary, sometimes cutting music. It is the journey of becoming an adult and all the things that come with it, like anxiousness, expectations and ultimate lack of control. Confusion begins with “Swamp and Bay”. If someone was to ask me what “Swamp and Bay” is actually about I would reply with a lady shrugging shoulders emoji. All I know is this song sings to my own emo, anti-folk self. Tucker’s voice is assertive and dominating in this indie rock song that is filled with head-banging and self-loathing goodness. The guitar solo is a perfect homage to teenage bands, the source of many a misguided and lyrically confusing attempt at expressing teenage frustration. “Lucky Joke” is a shoegaze indie punk wonder, a manifestation of deep teenage sorrow driven by the weight of expectation. Tividad’s level voice paired with minimal harmony is the voice of observation, injecting a sense of pity and judgment to a song that struggles with modern expectations and the monotony of the everyday. The rest of the album may be cutting and poking modern life in the soft bits with a very pointy tip but “All Blacked Out” levels the album out enticing the listener into a dream-like state. This song has the ability to bring on an existential crisis, making you feel small in a sound that seems to infiltrate the air. The steady acoustic guitar keeps the song on a level plane while the wavering guitar in the background becomes unsettling. Encompassing the listener, Girlpool creates a link between time and the universe, whispering the impending doom of the future. The ghostly sound on an inner monologue highlights the eternal juxtaposition of optimism for the future and the paralysing futility of it all. While this album sounds more progressive and mature, to a point, it seems right to question why Girlpool continue to keep their teenage sound and lines of enquiry. Their unbridled approach to huge life questions brings a clarity. A clarity that comes with non-conforming, to questioning and to individualism. They bring these questions back to the fore to make sure that teenage clarity and non-conforming persists with a courage telling us that they feel it too. With an honesty and candour, What Chaos is Imaginary, is an angry, social conscious album that may lead to an existential crisis. You have been warned.